At the second annual Pure //Accelerate conference held at Pier 70 in San Francisco, CA on June 13-14, 2017, Pure Storage laid out its vision for the foreseeable future. From the financial side, Scott Dietzen, CEO of Pure Storage expressed a desire to hit the magical $1B run rate by this fiscal year, and to be at a $2B run rate within three years. While history is no predictor of the future, Neuralytix believes that these are attainable and reasonable targets for Pure Storage. 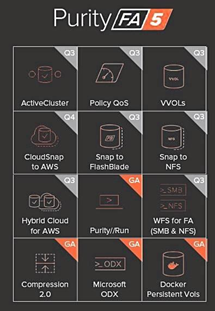 During the conference, Pure Storage announced a staggering 27 enhancements and updates to its FlashArray and FlashBlade all-flash arrays, and Pure1 support service. Along with these announcements, Pure Storage also focused on the idea of Edge Computing, citing market research data that suggests by 2020, the available bandwidth on the Internet will only sustain the transfer of 5% of the data created. From this, Pure Storage posits that more storing and processing of data will occur at the edge of the Cloud as opposed to the traditional approach of aggregating data from the edge at core datacenters. In order to process the amount of expected data at the edge of the Cloud, Pure Storage demonstrated an example configuration of its “tomorrow’s cloud block” (a play on Dell EMC’s vBlock converged architecture) in which it combines 1,300 cores of compute with 50TB DRAM memory, 2.6PB NAND flash, 100Gb/s Ethernet networking and the data traveling over NVMe/F with μs latency end-to-end (see Figure 1). This configuration is available for general availability under Pure Storage’s partnership with Cisco, and aptly named FlashStack. Along with the FlashStack, as noted earlier, Pure Storage announced 27 new enhancements and features. This is a dizzying number of announcements for a company of Pure Storage’s size. Many of the features and enhancements represent catch-up features that further bring Pure Storage arrays better in-line with offerings from more established vendors (such as ActiveCluster, Policy QoS and VVOLs for FlashArray, IPv6 and SnapShots for FlashBlade). That said, these “catch-up” features, when considered not as parts, but the sum of the parts, makes Pure Storage arrays one of the most feature-rich, reliable, and sustainable all-flash arrays (AFA) in the market today. So, while each individual “catch-up” feature may be found in one or some of Pure Storage’s competitors, when you take into consideration ALL the features, including existing features, Pure Storage arrays, in Neuralytix’s opinion, continues to be the leader in the AFA market from a product perspective. Figures 2, 5-7 shows the announcements and the associated availability. One should note that Purity for FlashArray (FA) and Purity for FlashBlade (FB) are different., despite the fact that both are called Purity. While NAND flash prices continue to drop, it is still the most expensive media available by raw capacity. So, using NAND flash to store (hopefully) infrequently used data such as snapshots can be a costly exercise that can be offloaded elsewhere. Pure Storage announced its CloudSnap option that allows enterprises to store their snapshots, whither else, but the Cloud! CloudSnap now enables FlashArrays to store snapshots on the array, on a FlashBlade, and in Amazon Web Services (AWS). This is a very clever idea, and Pure Storage advises that they will be working hard to extend the capabilities of CloudSnap to eventually enabling hydration of the snapshots within AWS, say, in an EC2 instance for fault and disaster tolerance. This demonstrates some forward thinking on the part of Pure Storage, to allow enterprises to leverage the best of on-premise (or colocation) and the public cloud. In fact, with this release, Pure Storage now has six options for enterprises to store their snapshots. See Figure 3. Perhaps the most interesting new feature from Pure Storage is Purity//Run, which allows customers to run their own software from within the FlashArray. Essentially, Pure Storage has provided a Docker container system that allows customers to put software such as backup software, or, in Pure Storage’s case, run Windows File Services (WFS) in one of these VMs. By no means is Purity//Run a full hyperconverged infrastructure (HCI) solution. For example, Pure Storage does not recommend running VDI or a database on Purity//Run. But this opens up new use cases for data specific applications such as anti-virus. Neuralytix asked the engineering team why they did not build out a full HCI system, and the decision taken by Pure Storage was that they would have to upgrade the processors significantly, and deploy a scale-out capability. Since FlashArray is geared towards the mid market and above, they felt that at this time, the opportunity was not big enough to justify the necessary changes. Also known generically as stretch clusters, Pure Storage is catching up to other leading vendors with its implementation of ActiveClusters that allow FlashArrays to be located in different parts of a campus environment, while maintaining synchronicity across all controllers. Unlike other vendors, this is a no cost option from Pure Storage. It provides zero RPO and RTO, or additional hardware. ActiveCluster allows up to two FlashArrays to be clustered together with transparent failover up to 150 miles away; with a third FlashArray that can be located anywhere in the world that will asynchronously mirror the two other ActiveCluster members. 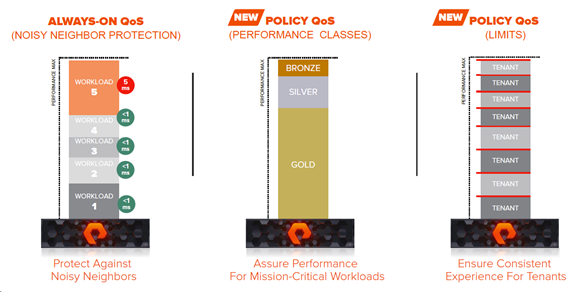 With Purity FlashArray 5 (FA5), Pure Storage also introduced policy based Quality of Service (QoS). Now, there are three different ways in which Purity FA5. See Figure 4. These three methodologies provide enterprises with various options to ensure the performance either by specific workloads, a workload class, or by tenant. Another exciting new feature is the availability of a S3-compatible object store for FlashBlade. The capability went general availability (GA) at 10pm the night before Pure //Accelerate started. Pure Storage has designed a completely separate object interface independent of its file interfaces for FlashBlade. They claim that the combination of their advanced flash technology, and this separate object interface that is S3 compatible, customers can now develop applications that are high performance workloads and use objects as the primary data store. This reverses the previously generally accepted idea that object stores were too slow for tier 1 applications, and has since been relegated to tier 2 or tier 3 storage only. While the use of object storage for tier 1 applications is still nascent, Pure Storage claims that it is over 10 times faster to first byte compared to AWS S3, and over 100 times faster indexing one million data objects compared to a leading webscale company’s existing solution. Many of FlashBlade’s workloads need large amounts of data. While FlashBlade is capable of hosting half a petabyte on each shelf, many customers have needed even more than half a petabyte of storage. In response to this, Pure Storage has designed an “aggregation module” (full product name yet to be released) that comes as two 1RU top of rack switches, each with 32 100Gbps connections to connect up to five FlashBlades together delivering up to 8PB of flash storage in 22RU. This capability is expected in Q4. The same 8PB of flash storage can be addressed via a single namespace, allowing billions of objects and files to be stored on the scale out FlashBlade. The scaled-out FlashBlade can be addressed with a single IP address, and also comes with Pure Storage’s Evergreen guarantee that ensures customers have the latest version of hardware and software throughout the entire ownership of the solution. The performance for the scale-out FlashBlade is also expected to increase in a straight-line, with a maximum of 75GB/s read and 25GB/s write speed, and a maximum of 7.5M IOPS. For the FlashArray, Pure Storage announced the DirectFlash Shelf that provides Native NVMe/F expansion shelf over 50Gb/s Ethernet using the RDMA over Converged Ethernet (RoCE) v2 protocol. As for the FlashBlade, Pure Storage introduced a medium capacity FlashBlade with 17TB of flash on it, placing it between the 8TB and 52TB blades. This will allow customers who do not need 1.6PB of usable capacity, but need more than 98TB of usable capacity. With the 17TB blade, depending on configuration, it provides either 190TB or 525TB of usable storage. Pure Storage has always had a superior phone home capability in which 80% of the tech support cases are Pure Storage initiated cases, as opposed to 20% that are customer initiated cases. Behind this is an intelligent machine learning driven engine. Pure1 META extends this. The idea behind this is to enable Pure Storage to have deeper understanding of the metadata, and create profiles that are associated with specific workloads so that it can enable Pure Storage to tune the storage to meet the customer’s workloads. Resulting from that is a fingerprint or a workload based DNA profile. This can help Pure Storage and the customer match up ideal sizing to optimize capacity and performance. 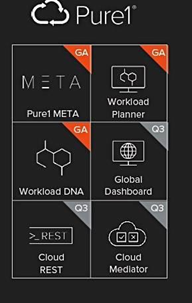 Pure Storage intends to gather data from all its units and through Pure1 META engage machine learning to come up with these DNA fingerprints, and allow customers to use Workload Planner to see the impact of new workloads on their arrays. During the conference, Pure Storage, along with Cisco demonstrated how NVMe/F is a reality, and with its FlashArray //X that contains end-to-end NVMe, it can now deliver the speed and flexibility of NVMe over fabrics. The overall direction of Pure Storage is impressive. It recognized early, that it cannot be a single product company, and that the focus is not on the storage, but on the data. Solutions such as Pure1 META and Workload DNA profiling will enable Pure Storage to be viewed as a data platform, rather than just another All-Flash Array (AFA) company. Pure Storage has also exploited its technology alliance partners such as Cisco and Rubrik to deliver state-of-the-art solutions. Neuralytix continues to be very bullish on Pure Storage. So far, Pure Storage has made some very good bets that are paying off. HCI is a scalable software-defined architecture that integrates compute, storage, networking, security, virtualization, and management resources in a single commodity common-off-the-shelf (COTS) server supported by a single vendor. HCI scales from a single node to multiple nodes with minimal administrator intervention and the resulting cluster resources are then pooled and available to authorized users.